Ahhhhh! I can't believe it's finally here!!! 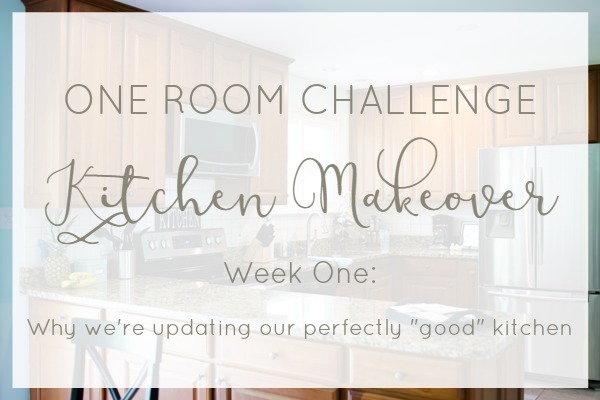 Today marks day one of the fall 2016 One Room Challenge! Not familiar with this challenge? 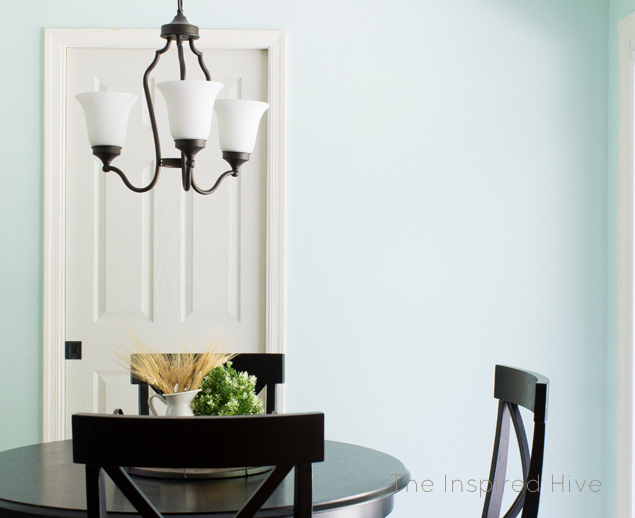 It's hosted by Calling It Home and is a fun time for bloggers to get creative and transform an entire room in just six weeks! I am so excited to be a guest participant in this challenge for the first time!! I'll be tackling our kitchen over the next six weeks and can't wait to make it feel a little more like us. Okay, now let me prepare you for the before shots... Our kitchen really isn't that bad. The previous homeowners had actually just renovated it before we moved in, and plenty of people have told us how beautiful it is. The thing is, it's just not us. You know how when you move into a place and the walls are still the previous homeowners' color choices, it just doesn't quite feel like home yet? Something as simple as wall color can make it feel more like your own personality. Well, in our kitchen, three years later, it still doesn't feel like home. We painted the golden walls when we moved in, but I quickly regretted my color choice. I was trying to match our "celadon" dishes from Sophie Conran, but the color turned out a little brighter than expected. 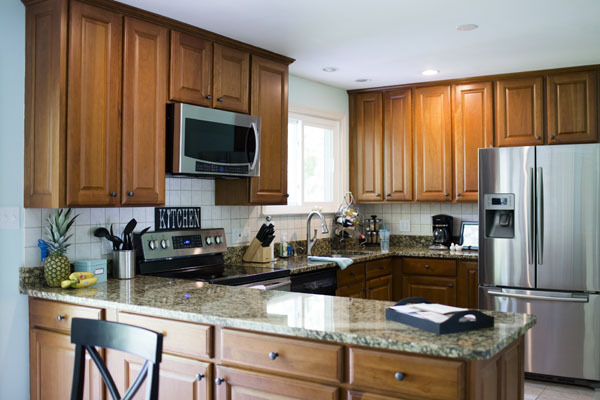 And while the granite is very pretty, it looks too warm for my taste with those cherry cabinets. Don't get me wrong, they're beautiful cabinets, but I would have never picked cherry on my own! As you can see, it has nice new stainless steel appliances. And the granite really isn't so bad. I think I can pull the cooler tones out of it with the right paint colors. But that backsplash... ugh! I love the huge oversized sliding glass door they installed. We love to be able to enjoy the outdoors even from inside. I changed that light fixture when we first moved in... there was a hideous pineapple chandelier before (yes, I said pineapple)! The current light doesn't exactly go with my design plan, but I think I have an idea to make it work! And here's what it looks like currently. Now, we have a pocket door instead of the bifold doors, and a ton more wall space! It's like a blank canvas calling my name! 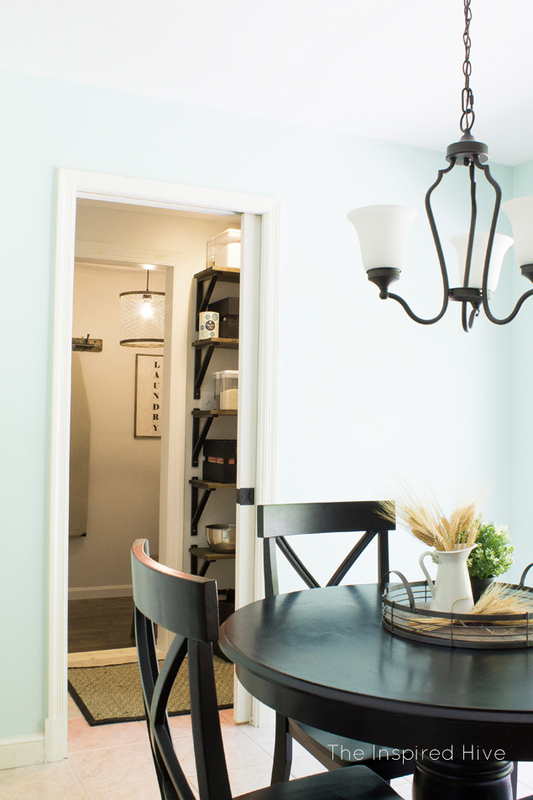 If you want to see more before and after photos, you can find the laundry room build here and the pantry makeover here. We've put off working on this space for a while because we almost felt guilty for redoing a brand new kitchen, but now that it's been three years, we're going for it! I'm so excited! Next week, I'll share our progress so far plus my design plans! I will probably share some tutorials along the way and save some of them for after the challenge. As you can probably imagine, tackling all of this in just six weeks with our little one will be no easy feat! So it may take me a while to get to everything! But stay tuned, I promise to share all of the details at some point or another! While you kitchen is nice in its current state, it's so important for a house to feel like home. Excited to see what you end up doing! Thank you! We are so ready for this room to show our own tastes!!! I'm exciting to see what you do! I think it's going to great! your pantry/laundry room remodel is wonderful, so hopefully the tight schedule will not be a problem for your kitchen makeover, I can imagine you have some great plans. Good luck with your little helper! 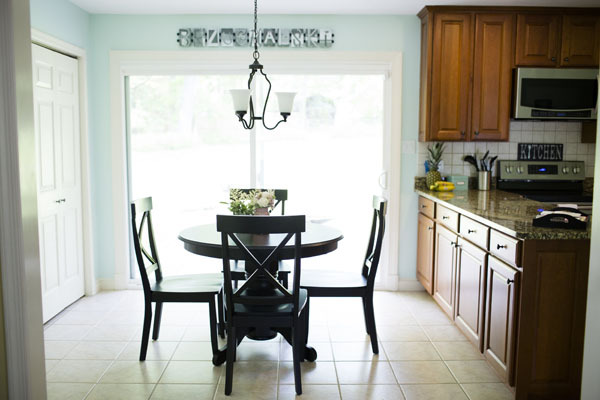 can't wait to see you make this kitchen yours and give it some more personality! Thanks, Cassie! Personality is exactly what this kitchen needs! So glad you decided to make changes so it feels like home, Nicole! Excited to see what you're going to do! It'll be beautiful I'm sure! Thanks so much, Kendra! Can't wait to see your project too!!! We can't wait to see how you work your magic in this kitchen! We know it will be fabulous! Hi Nicole, I know what you mean about putting your stamp on your home. It does make a difference and I'm excited to see how your kitchen progresses over the next 6 weeks...with the wee one in tow. Have a great, and productive, weekend. Can't wait to see how your change the room, Nicole!